Product description: Specs: - Overall size: 24"l x 23.6"w x 41.5"h - seat size: 16.5''l x 19.3''w - back size: 16.9"w x 23.6''h - seat height: 41.5''h - color: Black - n w:50.8lbs - g w: 51.2lbs features: - Covered arm rests - sturdy, heavy-duty base and frame for durability - modern ribbed stitching with pu leather upholstery, to offer extra comfortable for many hours. -Weight capacity: 250 lbs - easy assembling and cleaning up package include: - 2 x office chair - 1 x installation instruction. 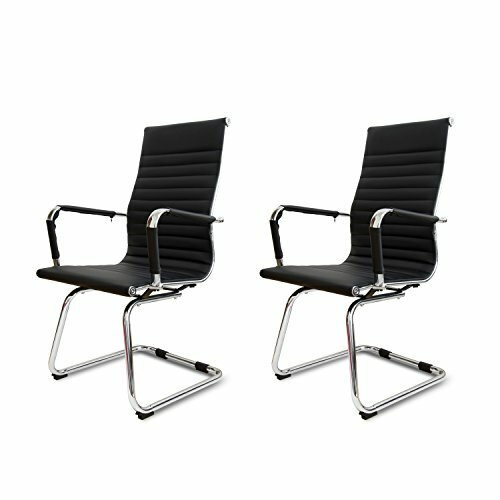 Classic Replica visitors chair in BLACK PU leather. Chrome arms with protective arm sleeves with zip available. Sold in a box of TWO chairs with FREE shipping. SAVE 18% buying 2.